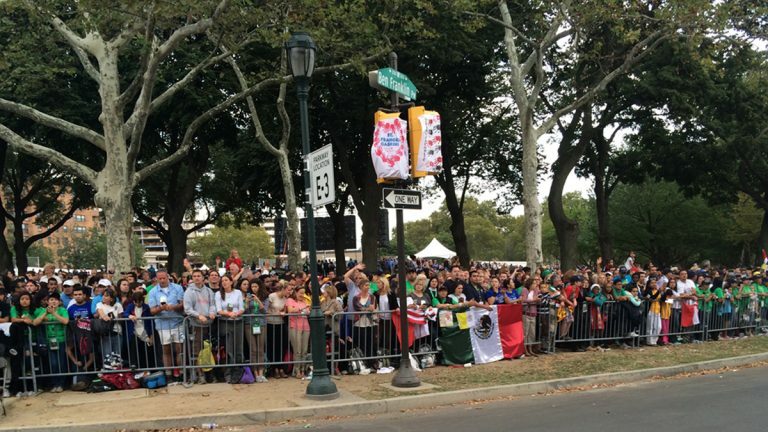 Crowds along the Benjamin Franklin Parkway have begun to swell in advance of Pope Francis’s appearance at a Vatican-sponsored “Festival of Families” Saturday night. Pilgrims waited up to 45 minutes to clear security checkpoints late Saturday afternoon, but described the process as orderly. Crowds up to five deep lined the papal parade route. 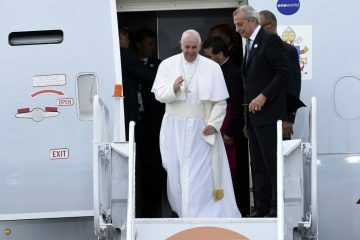 At 6:45 p.m., Francis is scheduled to travel the length of the Parkway from the Philadelphia Museum of Art and City Hall and back in his open-air popemobile, a 2-mile loop. The festival, featuring Italian tenor Andrea Bocelli, “Queen of Soul” Aretha Franklin and other entertainers, is set to start around 7:30 p.m.
Two boys tossed a small green-and-black football. 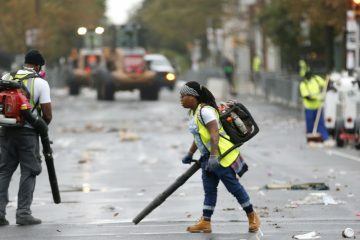 Another group of four children swatted a blowup ball, nearly hitting a nun who tipped it back to them. Jay Berryman was in a group of 160 from North Little Rock, Arkansas. He noticed a change in mood as the pope’s visit neared. “Everyone’s getting nervous,” he said.